1.Stable voltage and balance the current, avoid the waste of electricity invalid. 2.Internal leakage protection measures make it safe and reliable; extend the service life of the electrical product. 3.Easy to use, reduce your power consumption and save between 20% and 35% of electricity. 4.Smart, sleek design with LED lights to indicate operation. 6.No need for maintenance, no need to pay attention. 1.plug the power factor saver into any socket at home, and assure it is plugged in; the indication lamp has to be lighted up. 2.Simple and easy operation, just plug in. According to the number of home appliances you have, use one or more power factor saver. Much Stable - Optimization is conducted on Circuit Board, totally according to the international standard. Much Safe - Grounded electricity leakage protection, advanced imported fireproof and blast proof material. 1. When using, plug it into any socket, no need for maintenance, no need to pay attention. 2. After using, don't take off often. Avoid influencing the result of saving electricity. 3. Don't let the kids touch it. Assure their safety. 4. Please don't open or repair it by yourself. 1. SAVING ENERGY : The Amebay electronic saving box will Provide stable voltage and balance the current, prevent voltage instability, let electricity stable equilibrium and achieve power-saving effect, and improve the use of electrical appliances power, avoid the waste of electricity invalid ,thus extend the service life of the electrical product. 2. 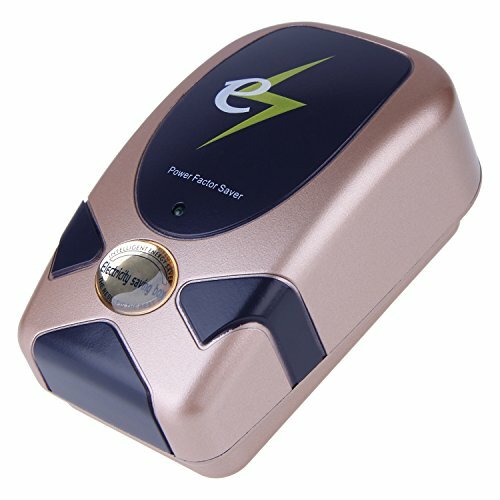 SAFE AND RELIABLE: The power saver device will release the electricity which it stored by using a system of capacitors in a smoother way to normal without the spikes when it works under the rated load, the external shell adopts advanced fire-proof and explosion-proof material, and internal leakage protection measures make it safe and reliable. 3. EASY TO USE: You just plug the Amebay electricity energy saver into a power socket and the color of indicator light will turn to green, then starts to work by keeping the device connected; it will reduce your power consumption and save between 20% and 35% of electricity. The power-saving effect of energy power saver will be shown in a month. 5. QUALITY AND AFTER-SERVICE: The Amebay saving energy device has brand logo with high quality. And we will be tracking customer's product experience in time, and make an efficient and quick after-service for you. If you have any questions about this product by Amebay, contact us by completing and submitting the form below. If you are looking for a specif part number, please include it with your message.